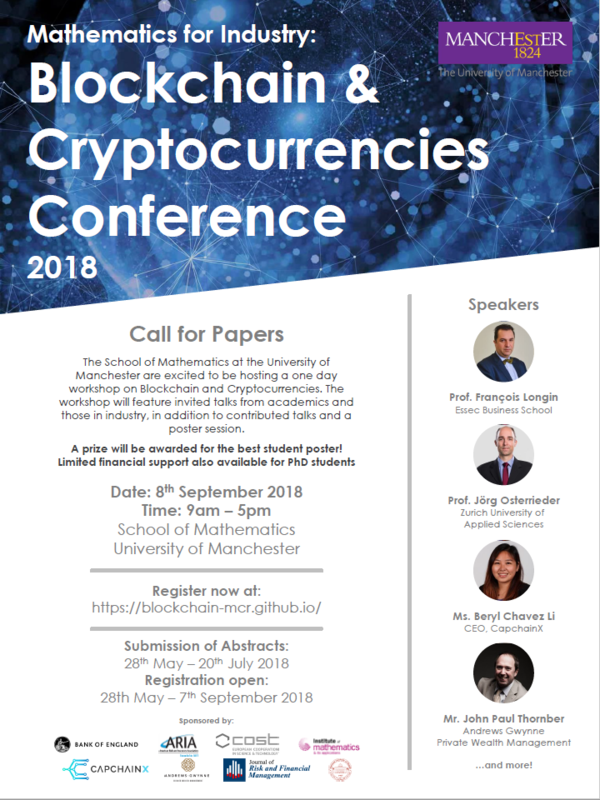 A one-day conference Mathematics for Industry: Blockchain and Cryptocurrencies is due to be held in the School of Mathematics at the University of Manchester, UK, on 8th September 2018. The aim of the workshop is to strengthen the ties and bridge the gap between academics and industry, and also enthusiasts. This will provide an opportunity to promote and share recent research and developments in the relatively new area of blockchain and cryptocurrencies. The workshop will feature invited talks from academics and those in industry, in addition to contributed talks and a poster session. This conference will allow us to learn about how these two key tools are being used by both sides, and how academic research can support work in industry. The meeting will also strengthen and promote mathematics for industry regionally, in the UK, across the EU, and also in the Middle East.